It threw us a little off our rhythm, recently, when we learned there's a group of Mayo poets that gathers each Friday in a meeting room in the Kahler Hotel in Rochester. Well, it's a group of POETS, really, but we'll come back to that. 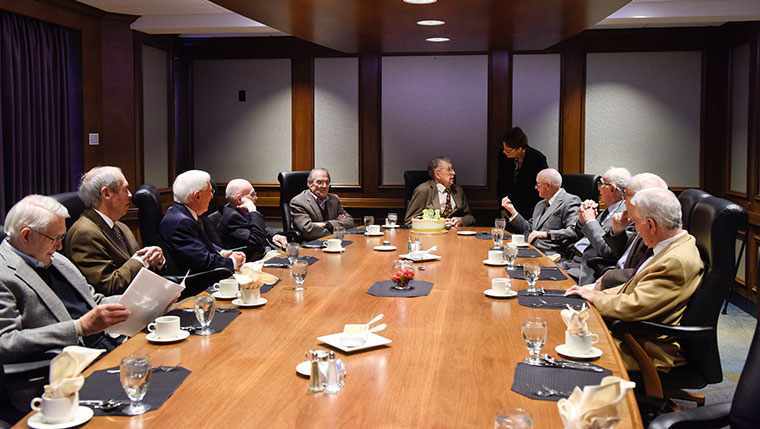 This past Friday, members of the little-known-but-not-that-secretive group gathered to celebrate the birthday of one of their own. That might not seem like a big deal, but getting 101 candles on a cake is no mean feat. Lewis Woolner, M.D., an emeritus Mayo pathologist, was the birthday boy. He used the moment to share a verse that he clearly enjoyed and that struck a chord with the others gathered for the occasion. Dr. Woolner has an impressive resume to match his impressive run, as do many in the company he keeps at the POETS gatherings. He was born in Prince Edward Island, Canada, and raised on a potato farm before coming to the cornfields of Southeast Minnesota. 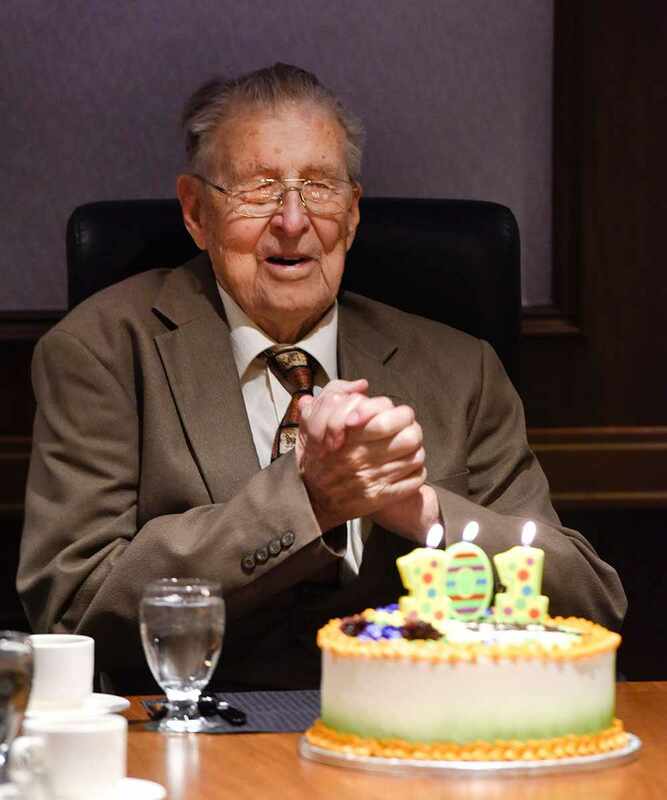 He was introduced to Mayo Clinic on a stop during his honeymoon to visit well-known Mayo pathologist Malcolm Dockerty, M.D., also from Prince Edward Island. (Further questioning revealed that Rochester may not have been the primary honeymoon destination.) Dr. Woolner joined the Mayo staff as a surgical pathologist in 1948. Known as one of the best ever diagnostic surgical pathologists at Mayo, he is often compared to Mayo's first pathologist, Louis Wilson, M.D., who had the same initials and a similar upbringing. You can wax poetic while sharing your comments below, and you can share this story with others using the handy tools atop this page. Gentleman of the POETS club. I enjoyed this article and thank you for mentioning my father. Slade often mentioned the POETS club which met, of course, on Fridays, to justify its scurrilous acronym. If any of you retirees are old enough to remember him, you are indeed old. That he raised a rhyming son may have been a source of embarrassment to him for all I know, but here is a rhyme about the good old soul I scribbled just this month. Carry on! “The rule is this,” he said. When followed by a U..
As in ‘surely sugar,’ son. And found the only two. And care for those in need.